Yes, there’s something you can do about high prescription costs. Rx Savings Solutions provides what every consumer needs to make the smart choice. Discover all the options available to treat your condition and compare them to your current prescription(s). Know exactly what a medication costs at every pharmacy, if your plan covers it, and the impact on your deductible. 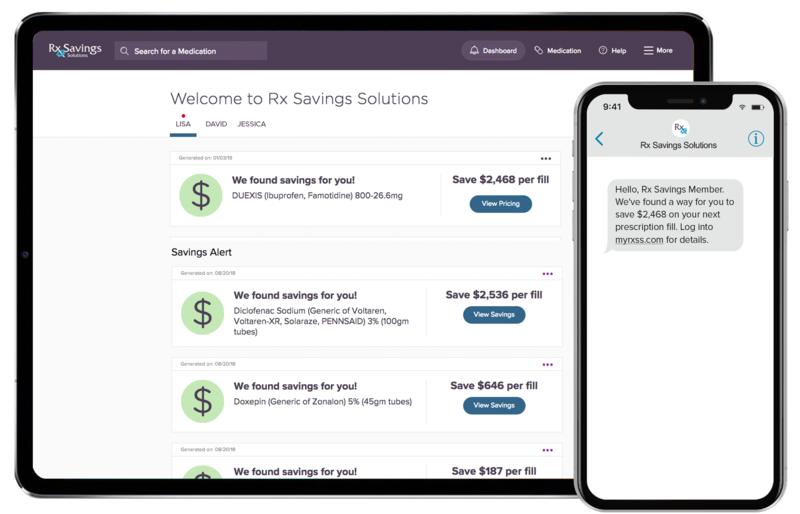 Never miss a savings opportunity, even in the doctor’s office, and request a lower-cost prescription in just a few clicks. My new medication works just the same and my savings ($1,661 per fill) wouldn’t have been possible without your help. Thanks, Rx Savings Solutions! We find all the medication options for your condition. You decide what’s best for your health and budget. Make total sense of your pharmacy benefit—simple, clinically sound choices you probably didn’t know you had. Proactive notifications tell you when you can save money on your prescription. No effort required. Change to a lower-cost prescription (if necessary) in one click. We handle it all with your doctor and pharmacy. Reminders and other tools in your portal keep you organized and on schedule with all your medication(s). Our Pharmacy Support team is made up of former retail pharmacy technicians who can’t wait to help you.